Companies are utilizing QR code advertising campaigns to lead customers to extended product information, discounts, and an enhanced shopping experience. Grocery store chains are using QR code coupons and other exclusive offers to increase customer interaction through loyalty programs. Conference organizers are reducing the bulk of handouts attendees are carrying by creating codes that link to information about the schedule and speakers; as well as codes to advertise nearby restaurants and services. This same evolving digital landscape that has provided exciting new ways for advertisers and marketers to connect with consumers has also presented challenges around data management and integration of QR code advertising with traditional marketing campaigns. With so many opportunities for measurement, businesses find themselves submersed in oceans of data and are hard pressed to identify trends or gain useful insight to their consumer’s behavior. The integration of QR codes to your advertising campaign carries the benefit of automatic data capture, providing useful information about how your customers are interacting with your sales environment and products. 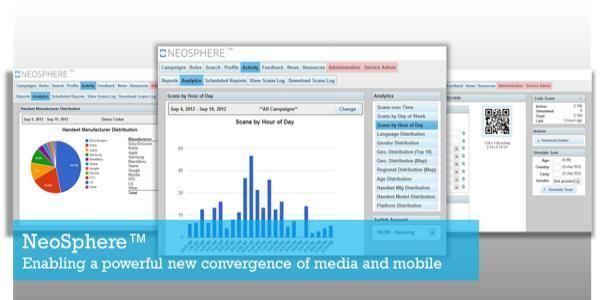 Track the progress of your QR code advertising campaigns in real time and enjoy the convenience of centralized management through NeoSphere’s interactive dashboard. Then segment your data to gain useful insights about your audience and discover how to target their needs more accurately. Whether your needs are suited to a self-service QR code solution like QodeScan, or an advanced QR campaign management tool like NeoSphere, applications from NeoMedia are the right fit for your business. And if you happen to be a developer wanting to create an app with scanning capabilities baked in, get started today with our free 30 day trial of NeoReader SDK!